Let Market Sector Trading Keep You In The Right Stocks, Now! "Market Sector Trading Will Have You In The Right Stocks At The Right Time... Every Time!" 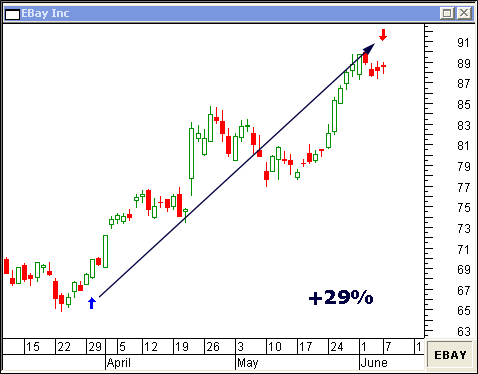 arket Sector Trading is an indispensable stock picking method every investor should know. Effective and easy to execute... sector trading virtually guarantees you'll be trading the strongest stocks relative to the broad market. "What is the broad market, anyway?..." The Dow Jones index is comprised of 30 stocks which represent a cross section of the US industrial complex. The Standard and Poor's index, or S&P 500, is a representation of large, capitalized companies. And, the Nasdaq index exhibits stocks of companies that are technically focused. There are well over 16,000 stocks, bonds and mutual funds... more, if you include commodities and futures. Fortunately, the major exchanges have grouped specific stocks into narrowly-focused indices. For example, the Philadelphia Stock Exchange has 15 sector indices ranging from banking to utilities... each consisting of a small number of stocks. 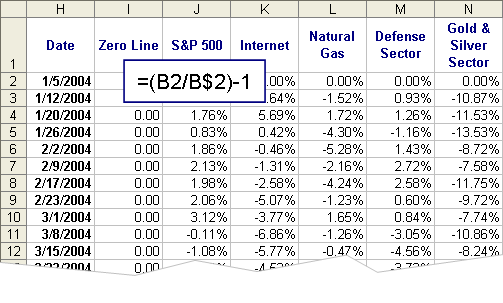 Remember, valid sector trading analysis begins with a wide spectrum of leading industries... so, you'll want to include the S&P 500 and a handful of key stock sector indices. Now that you have some indices in mind, it's time to compare them to each other... ultimately, leaving a short list of tradable stocks. In order to employ Market Sector Trading, you will need a spreadsheet application and a stock data source. 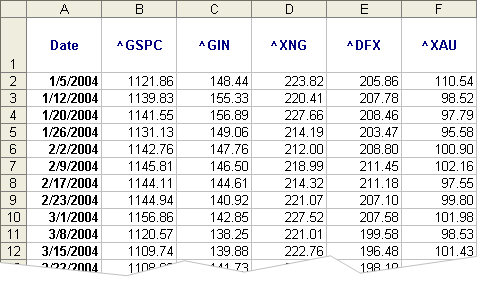 For the following example, Microsoft® Excel and Yahoo!® Finance data were used. 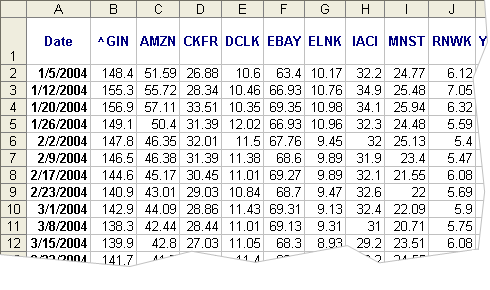 Finally, use the Excel Chart Wizard to create the comparison chart. 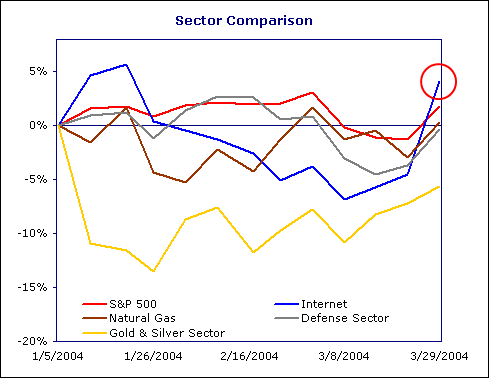 Looking at the chart, you can easily see the Internet index is out-performing the other indices. 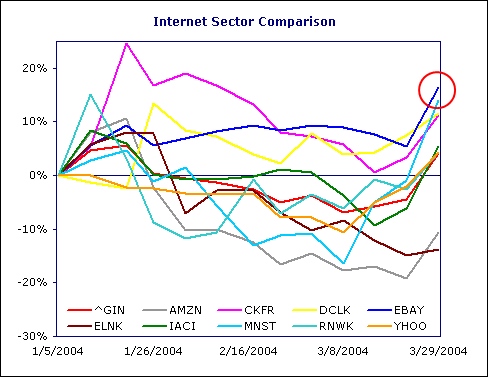 Now... take the stocks of the Internet index and run them through the same sector trading comparison process. 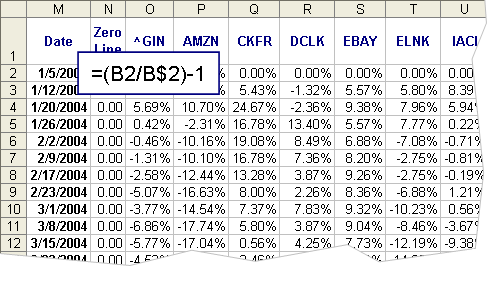 Again, there is a clear front-runner... Ebay Inc (EBAY). How did EBay Inc do over the next couple of months? It was up a whopping 29%! Now, don't jump blindly into a stock. Apply additional forecasting analysis techniques like Fibonacci Retracement and Elliott Wave to determine the optimal entry price. Doyle, Phil . "Relative Performance Charting," trading techniques, Technical Analysis of STOCKS & COMMODITIES, Volume 19: May. Technical Analysis of STOCKS & COMMODITIES, The Traders' Magazine ™, is the magazine for investors and market technicians. 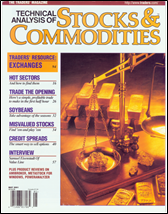 Every issue provides information on how to use charts and computers to trade the markets. Get your FREE trial issue, today!